We’re hittin’ the arcades and those sticky, day-glo carpets are gonna be blood-soaked! 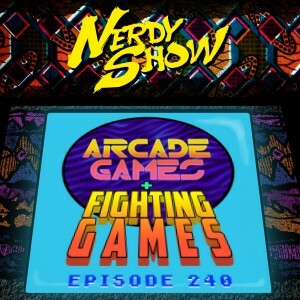 In this episode of Nerdy Show we’ve mashed up two listener requested Microsode topics: Arcade Games and Fighting Games and we’ve got so much to say it’s gone overtime. Join Cap, Brandon, Jonathan and Andrew from Wicked Anime, and Briggs and Wall from Ghostbusters: Resurrection as we recollect on the titles of our misspent youth in 90s arcades – from classic titles to the most obscure cabinets we can remember. Hear our triumphs in those darkened, hallowed grounds as well as our greatest defeats. Then it’s on to that special subset of the arcade that made its way to the home console: fighting games. What’s the difference between fighting games, beat ’em ups, and sports titles? What are our favorite games and who are our mains? And what are some of the weirdest early 90s fighters we can remember? All these and more, just INSERT COIN. Thanks to Sean Redd and Hexual for the topics and come see Cap and Aaron at NC Comicon in Durham, NC November 13-15.